Hemet United Methodist Church – "Loving God, Serving Neighbor"
APRIL 21 -EASTER EGG HUNT – 12:00 P.M.
After Worship in the Sanctuary, in the grass area of Education Building, we will have an Easter Egg Hunt. Everyone is welcome. 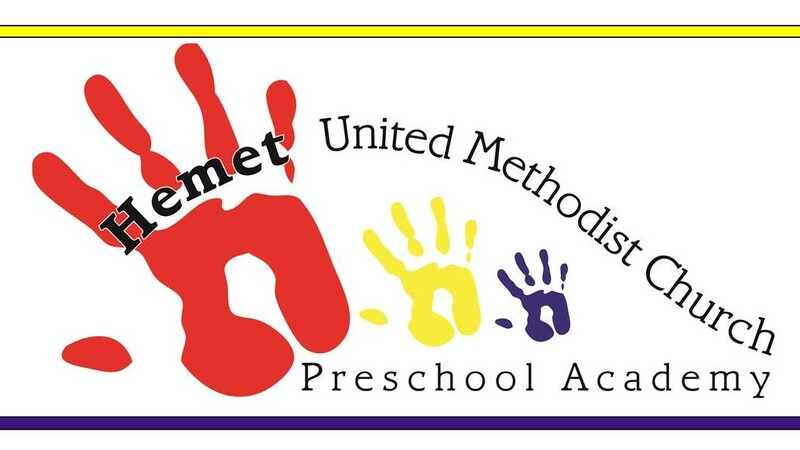 Pre-School Monday—Friday 9:00 a.m.—12:00 p.m.
A person becomes a professing member of the United Methodist church when they have been baptized and publicly profess the vows of the baptismal covenant, affirming their faith in God and their desire to live as a disciple of Jesus Christ. They commit to a life of service in and through the local congregation. Registration Cost: Registration is $40. Registration cost includes light lunch, manuals, safe sanctuary training, and background check. Additional Materials: Participants owning a laptop or WiFi-enabled tablet are encouraged to bring one, in order to efficiently process paperwork related to certification. About the Class: The instructor for this class is Ken Ellis. Early Response Teams (ERTs) fill specific needs in the early days after a disaster, such as cleaning out flood-damaged homes, removing debris, placing tarps on homes and otherwise helping to prevent further damage, while providing a caring Christian presence. To be eligible for an ERT team, participants must take the 8 hour Basic Class ERT. After completion, participants will receive an ERT identification card which is valid for three years. We have all been called as part of the Great Commission to make disciples. As soon as we walk out of the sanctuary, we are in mission. The Mission and Outreach Team is being created. If you have an interest in mission activities in Hemet or in the wider world, please look for details on an organizational meeting. Collecting canned goods for the local food bank and going to Mexico to work on construction projects are both missions that are valuable. The next trip to work at the Encinal Camp near Tecate, MX will be Saturday, April 27.
insulation and installing dry wall. Down and back the same day. APRIL 10TH AT 1:00 P.M.
Purchase Stater Brothers Scrip after worship and support the Youth Program. Scrip is like a gift card for $25 that can be used at Stater Bros.
A group is meeting Wednesdays, 11:00 a.m. in the Office Conference Room. The purpose of this group will be to pray and respond to the needs of the church and community. There will be opportunity to receive names to phone, send a card or perhaps even visit depending on your comfort level. See Pastor Val if you would like more information. All are invited to join this important ministry of the church. Children are treasures from God and here at UMC Hemet we strive to provide, not only children but everyone with Biblical teachings and Christian values. We encourage you to bring your children to Sunday School and experience God’s love and develop a personal relationship with Him. Noon, Conference Room – Bring your lunch. Also currently studying the Psalms. Conference room – Join us for a study of the Psalms. Please make note of the office emails and respond accordingly for bulletin, weekly reminders and calendar requests. office@hemetumc.org—Email here with bulletin and weekly reminder information, calendaring, membership information, address & phone number changes, and any other miscellaneous items. Bobbie@hemetumc.org—Email Bobbie Christie for assistance with reimbursements, giving and any financial business. 530 South Buena Vista St.
Monday to Thursdays 9:00 a. m. to 12:00 p.m.
We believe that children are individuals of worth and should be encouraged to encounter the world around them. It is our desire to foster independence, develop curiosity, and increase self-confidence. This positive self image frees the child to reach out and explore new ideas, and he/she develops physically, emotionally, intellectually, socially and spiritually.